A black and white print of Andrew Miller Ross. Andrew Miller Ross was born at Edinburgh, Scotland on October 9, 1851 and came to Whitby in 1856. As a young man he moved to Rockford, Illinois where he was married in 1875. He returned to Whitby about 1879 where he worked as a dry goods merchant for over forty years. 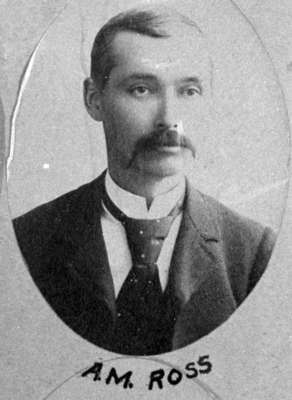 He was Deputy Reeve of Whitby in 1894 and Mayor from 1900-1902. He was responsible for planting many trees on the streets of Whitby. He died at Whitby on January 19, 1936 and is buried at Mount Lawn Cemetery, Whitby. This photo is from a frame of portraits of members of Composite Lodge No. 30 AF & AM. Andrew Miller Ross, 1892, W.E. O'Brien. Whitby Archives 31-002-053.